Braunschweig - Having surprised perhaps even themselves last season by winning promotion back to the Bundesliga after a nigh-on 30-year absence, Eintracht Braunschweig never expected the 2013/14 campaign to be a bed of roses. With three games remaining until the Bundesliga takes its traditional mid-winter break, the Lower Saxony club lie bottom of the table on eight points, a serious but as yet far from fatal situation, with fourth-bottom Eintracht Frankfurt still only three points in front of them. Where the discrepancy between the Braunschweig Lions and the rest is most glaring is in the 'goals for' column. Their total of just eight from 14 games is five shy of even the second leanest attack in the division while, by contrast, five teams have conceded more goals than Braunschweig's 26 and a further three are on exactly the same tally. In other words, Torsten Lieberknecht's men are mid-table in the defensive stakes and that is down in no small part to the form of their regular last line of defence – and freshly-minted Iran national team keeper - Daniel Davari. The 25-year-old has had to pick the ball out the back of the net 16 times in his ten season starts to date, with the team conceding ten in the four games he wasn't involved in. Davari's first two clean sheets on the short road trips to regional rivals VfL Wolfsburg and Hannover 96 helped Eintracht to four of their current eight points, while his third was pivotal to them earning another three with an eye-catching 1-0 home victory over high-flying Bayer Leverkusen. That largely unanticipated success has been the high point thus far of a campaign in which Braunschweig nonetheless appear to be gradually finding their feet. The modest provincial outfit have at any rate certainly not been overwhelmed by the reality of life in a Bundesliga radically different from the one they last took their leave of, way back in 1985. That was almost three years before Davari first saw the light of day in Gießen. 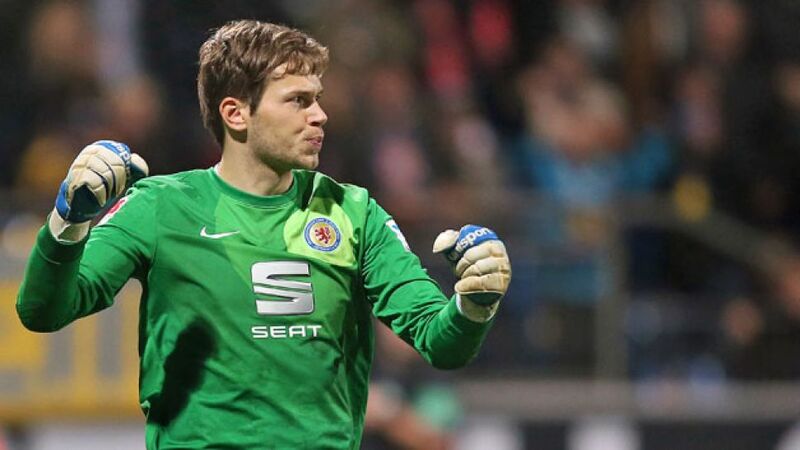 The son of a Polish-German mother and an Iranian father grew up in the university city in Hessen and, playing for local outfit TSG Gießen-Wieseck, was well into his teens before he turned his hand(s) to goalkeeping, having played as a striker up till then. A long apprenticeship followed, first in the youth and reserve ranks at 1. FSV Mainz 05 and then, from 2009 onwards, at Eintracht Braunschweig. The Lions were in the recently inaugurated national Third Division at that point and there, too, Davari had to wait patiently in the wings. By the time he seized the opportunity to establish his own first-team credentials, following an injury to regular No1 Marjan Petkovic early in the 2011/12 campaign, Eintracht were playing in Bundesliga 2. As the club's renaissance under Lieberknecht continued, his steady performances showed up on the radar of the Iranian FA's scouting network and in January 2013 the German-Iranian dual national was invited to join the squad for an AFC Asian Cup qualifier against Lebanon. On that occasion he opted to put club before country, with promotion-chasing Braunschweig due to face VfR Aalen just 48 hours after the game in Tehran. Ten months later, however, and now earning his corn in the Bundesliga, Davari took his international bow in a 3-0 victory over Thailand in Bangkok, a result which secured Iran a place at the 2015 Asian Cup finals. Hearing the national anthem before the match was, he later told the club website, “very moving, it gave me goosebumps". Having debuted with a win and a clean sheet, Davari then cemented his reputation in the national team by keeping goal in a 4-1 win against Lebanon. For his own part, he adheres to the philosophy that “if you perform to the best of your ability and push your body to the limit, more often than not you'll get the reward. That's certainly a pre-condition for earning points, anyway. I don't look at the standings very often, myself. At the end of the day, all that matters is the next game.” At the end of the season, meanwhile, Davari hopes to be looking forward to another top-flight campaign with Eintracht Braunschweig - and a fruitful trip to Brazil on World Cup business with Iran.